Singers: [TV commercial jingle] Central Services: We do the work, you do the pleasure. TV commercial pitchman: Hi, there. I want to talk to you about ducts. © Copyright 1939 by Irmaos Visale, Rio de Janeiro, Brazil. © Copyright 1939 by Southern Music Publishing Company Inc., New York, N.Y., U.S.A.
© Copyright assigned 1942 to Peer International Corporation, New York, N.Y., U.S.A.
Q: What did the giant samurai represent? Q: What was the hideous mask that the torturer wears? Q: What is the gift Sam keeps getting and giving? One of my favorite novels of all time is George Orwell's 1984, and Brazil is very much a comedic interpretation of that. Brazil shows us a hilarious exaggeration of the monotony of machine like run bureaucracy, and man's constant voyage to avoid responsibility. "That's not my department." Everyone seems to say. 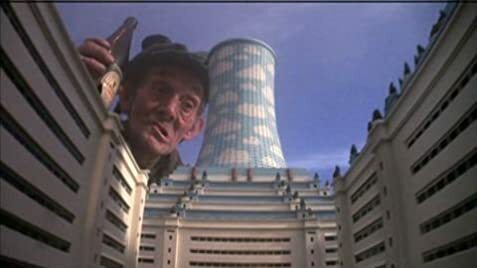 Sam Lowry (Jonathan Pryce) is a low ranking government employee. When an error leads to the execution of engineer Archibald Buttle (Brian Miller) instead of terrorist Archibald Tuttle (Robert De Niro), Sam attempts to fix this, and inadvertently becomes an enemy of the state. Read that scenario again. This is a funny movie. It's a dark comedy/political satire, and almost every joke works. The nonchalant attitude of the government depicted in the film is where a big chunk of the humor comes from. It's a very smart comedy. 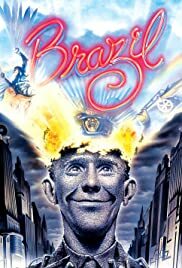 Honestly if you like political satire, then Brazil is one we can all enjoy together.